Grater gap tolerance makes parameter setting less sensitive. Synchro MIG feature (via taught waving function for AX robots) allows for optimal welding of thin-to-thick material. Ability to switch between AC and DC processes on-the-fly for materials that vary in thickness. 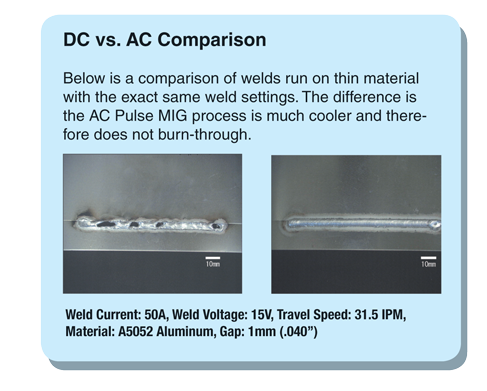 Are you tired of burn-through during thin plate welding? Do parts suffer form gaps that cannot be bridged? Do you spend a lot of time cleanig parts afterwards? 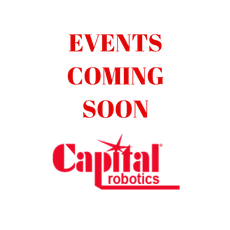 Need to find a solution? Look no further than the DC30 from OTC DAIHEN. 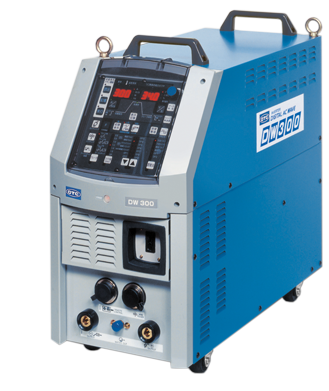 The DW300 is the most advanced welding pwwer supply to enter the market. Nu utilizing special AC wave forems that allow adjustment of the electrode negative (EN) half cycle, the DW300 is capable of controlling the heat in-put. These features realize welding of thin Plate material with freatly reduced heat distortion, and increadible gap bridging technology. For welding thicker materials, the DW300 supports a maximum output current of 300 Amps, which allows for stable welding and penetration for medium-thick plates.